Days of '47 beverage pairings for the valley's finest pies. At Uinta Brewing Co., employees bring pies to eat while sipping Uinta brews, and a Best Pie contest is held. A few years ago, KRCL radio's "Bad" Brad Wheeler came up with the idea to hold a pie-and-beer party as a fundraiser for the station. Today, KRCL's Annual Pie and Beer Day is a Salt Lake City staple. Local breweries will team up with local chefs to produce brews and pies for the event, which will be held on Sunday from 5-9 p.m. at downtown's Beer Bar (161 E. 200 South, 801-355-3618, BeerBarSLC.com). Chef-made pies in past years ran the gamut from sweet cream to a pork pie (snout included) and a smoked cherry pie with a balsamic glaze. Tickets (aka "Pie Passes") are available at the door for $25 per person, first come, first served. Be sure to show up early, as this event is very popular. Likewise, up in Huntsville, the holiday has become a very popular event at the Shooting Star Saloon (7350 E. 200 South, 801-745-2202, ShootingStarSaloon.co), with lots of fruit pies and plenty of tap beer. You know me; I'm always looking for interesting and effective food and drink pairings. So I thought, why not pie? Here are some partnerships featuring pies, beers and other beverages to please the pioneering palate. Many of those in the know agree that owner and chef Jeff Masten's Left Fork Grill (68 W. 3900 South, 801-266-4322, LeftForkGrill.ipower.com) makes some of the best pies in the valley. I know one of his secrets, but have pledged not to reveal it. Let's just say your grandmother would approve. You can grab the sandwich and slice of pie special at Left Fork Grill anytime, but if you're in the market for a whole pie, be sure to call 24 hours in advance. It would be a no-brainer to enjoy Masten's raspberry cream pie with a cold mug of Wasatch Brewery Raspberry Wheat beer—one of my favorite summertime sippers. Or, enjoy a peach pie with Epic Brewery's Brainless on Peaches Belgian-style Ale. It's part of Epic's Exponential Series, aged in oak casks, and also pairs nicely with chocolate and fruit cobbler. 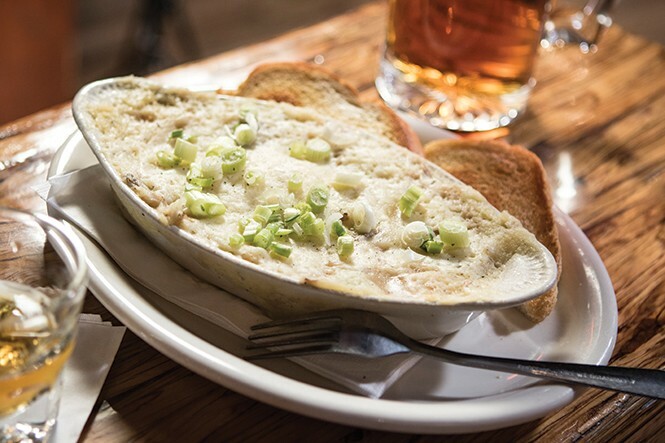 At MacCool's Public House (multiple locations, MacCoolsRestaurant.com), they serve up both classic shepherd's pie and a more modern version with ground buffalo, venison and andouille sausage. The buffalo shepherd's pie is simmered in Tetley's English ale, so why not enjoy a cold pint of Tetley's along with your pie? For the more traditional shepherd's pie made with roast beef, I'd lean toward an inexpensive Bordeaux or versatile Côtes-du-Rhône Villages or just a good ol' Guinness Stout. Piper Down (1492 S. State, 801-468-1492, PiperDownPub.com), too, cooks up a great shepherd's pie, and theirs is made with ground beef and topped with mashed potatoes and gravy. I think I'd select a Strongbow Hard Cider or Bohemian Brewery Viennese Lager from Piper Down's draft beers to pair with it. Or, go all-in and spring for a dram of Tullamore Dew 12-Year-Old Special Reserve Irish Whiskey. You will not find booze at the Nauvoo Café (15 E. South Temple, 801-539-3346, TempleSquare.com/Dining) in the historic Joseph Smith Memorial Building, on Pioneer Day or any other time. However, you will find what many consider to be the best damn turkey pot pies in the state, and maybe on the planet, made with flaky, rich Lion House pie dough. I'd recommend getting pot pies to take out. You're going to want something that is smooth and creamy (like the pot pie itself) to drink. Think in terms of a lightly oaked or unoaked chardonnay such as a nice French chablis. Or, a good beer to pair with chicken pot pie would be a Red Rock Brewery Golden Halo Blonde Ale, with light malts and subtle herbal notes. Hey, what about pizza pie? There are lots of options here. I'm certain that The Bayou (645 State, 801-961-8400, UtahBayou.com)—aka beervana—will be hopping on Pie and Beer Day. Where better than to spend the holiday than at a place with 425 different bottled beers to choose from, plus another 27 on draft? I'd get there early and order a jambalaya pizza, which calls for a Meantime Old Smoked Bock; it is slightly smoky, like the pie's andouille sausage. For a classic New York-style pizza pie, look no further than Este Pizzeria (multiple locations, EstePizzaCo.com). This is the real deal. And, frankly, I enjoy their pizza so much that I tend to relax and not be too finicky about beverage pairings. Sometimes I'll have a soda; at other times, a glass of house red wine or a $1.50 Pabst Blue Ribbon does the trick. And there you have it. Happy Pie and Beer Day!